Garnet is typically known as a red / translucent gemstone, but when beneficiated and appropriately sized, is used to make a harder abrasive alternative to quartz. After processing, almandine garnet features angular grains and has a hardness of 8-8.5 on the Mohs scale compared to quartz at only 7. Unlike quartz sand, due to its hardness, garnet can often be recycled after being used as an abrasive. Higher grade garnet performs better as an abrasive when softer minerals which break up and cause excess dust are removed. The flotation process typically yields the highest grade garnet compared to alternative separation methods using spirals or other gravity separators. Garnet minerals are extracted from complex ore bodies under specialized flotation conditions which facilitate separation of the heavier garnet from lighter gangue minerals. 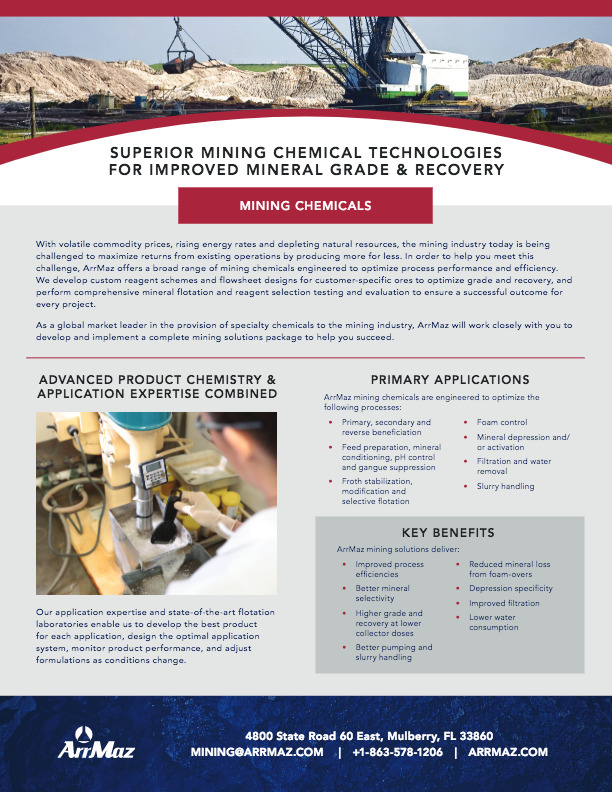 Specialized chemicals designed to suppress stubborn gangue minerals can be used to take the strain off of downstream processes. At ArrMaz, we produce process chemicals such as cationic and anionic collectors to optimize the flotation process while maximizing garnet mineral grade and recovery. We also produce functional chemicals including flocculants, slime depressants and dispersants to improve the selectivity of the flotation process as well as final product marketability. Finally, our polymers and flocculants help improve the water recycling system at the garnet flotation plant by effectively settling fine tailings. ArrMaz’s mining chemicals are tailor-made for each mineral processor’s unique ore and operational scenario, and are compliant with all applicable industry regulatory requirements. In addition to providing design consultation to garnet mineral producers using our chemicals in their flotation process, ArrMaz’s expert field personnel are also available as process advisors to our customers’ engineers, production managers and operations personnel.